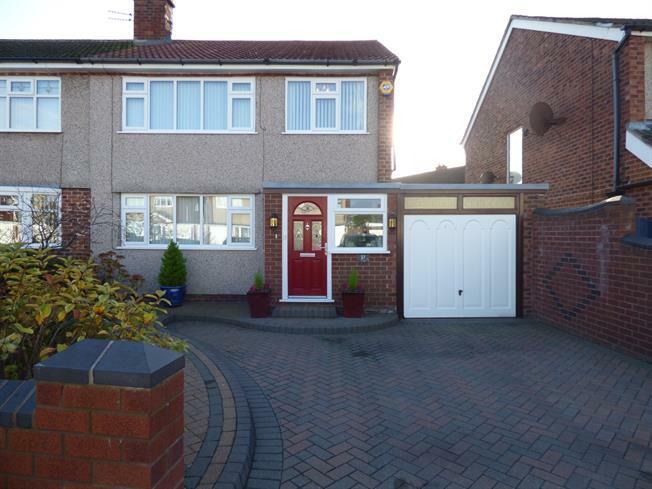 3 Bedroom Semi Detached House For Sale in Liverpool for Asking Price £215,000. Entwistle Green are presenting to the market this beautifully presented three bedroom semi-detached family home. The property briefly comprises; entrance hall, two reception rooms, conservatory, kitchen, utility, wc, first floor landing three bedrooms and a family bathroom. The property further benefits from a block paved driveway and fantastic rear garden. Early internal inspection of this impressive home is highly recommended. UV blinds. Sliding, vented "pest control" door. Double doors to garden. Fitted wall and base units with complementary work surfaces. Integrated fridge, dishwasher, oven, four ring gas hob and overhead extractor hood. Plumbing and housing for washing machine and dryer as well as space for "American" fridge/freezer. High gloss fitted wardrobes. Double glazed uPVC window to front. Radiator. Fitted wardrobes. Double glazed uPVC window to rear. Radiator. Shower cubicle. Bath. Low level wc. Wash basin inset vanity unit. Heated towel rail. Double glazed uPVC window. Tiled walls and flooring. To front block paved driveway. To rear Composite decking. Electric, remote controlled awning. Artificial lawn. Timber shed. Power and lighting. Up and over door. Integral access.